Panelists look on as Maine’s Public Advocate, Tim Schneider speaks to the audience. (L to R): Tim Schneider, Don Williams, Ph. D – NTIA, Danzel Hankinson – Leverettnet, Stan Williams – EC Fiber, Page Clason – Islesboro, Mark Erickson – RS Fiber, Carole Monroe – EC Fiber, (Not Pictured: Tim Herwig – Office of the Comptroller of the Currency). 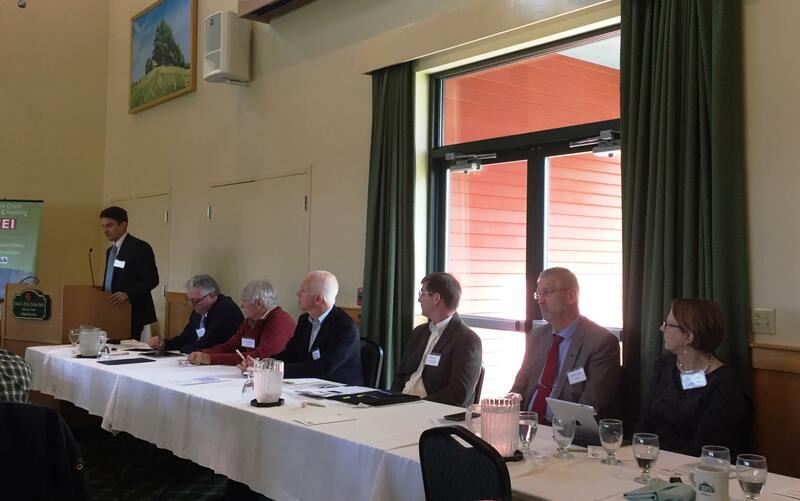 On Tuesday, we attended a forum entitled “Bringing Broadband to Maine’s Rural Communities: Insights for Maine from National Success Stories” in Hallowell, Maine. The event was sponsored by the Maine Broadband Coalition, CEI and Island Institute and featured regional and national speakers who outlined a variety of regional and national approaches to improving rural broadband access. Deploying advanced fiber-optic broadband in rural communities is a daunting proposition. Low population density leads to a high cost per home served. As a result, it can be very difficult to fund expansion projects using traditional, profit-driven models. We commend CEI and MBC for bringing so many experts together to discuss potential solutions to this problem. There is no one-size fits all solution. Panels included leaders from individual communities, regional alliances, and cooperatives. Each locality used its own unique approach to improving broadband service based upon the regulatory environment, political climate, and competitive environment that it faces. Whereas Leverett, MA and Islesboro decided to build and operate municipal networks, Vermont’s EC Fiber is a privately funded affiliation of 14 towns under an inter-local contract, and Winthrop, Minnesota’s RS Fiber formed a regional cooperative serving 17 rural Minnesota townships. Leverage your unique advantages. Communities wishing to improve rural broadband access in their town or region each have unique advantages that can be leveraged to get the job done. For example, Islesboro was able to obtain dark fibers connecting the Island to shore from Central Maine Power when the company installed a new submarine power cable. Rather than pay to lease this fiber, the town is obtaining access by swapping spare fibers it’s building on the island. Another advantage many towns have is the presence of middle mile fiber networks like Maine’s Three Ring Binder, Massachusetts’ MBI and Vermont Fiber Connect, which EC Fiber was able to use for both middle mile and last mile access. Third, an active group of small telecommunications companies is available and willing to invest in deployment, including Maine’s 22 independent telephone companies and its many Competitive Local Exchange Carriers. Get creative with financing. Attendees learned creative methods of financing fiber networks when private investment, municipal bonds and TIF’s aren’t the answer. One innovative option was the use of Crowd Funding techniques in the early days of Vermont’s EC Fiber. Another was the option to leverage the obligations of local banks under the Community Reinvestment Act into low-interest loans or even equity investments. There are also state and Federal grant programs to assist in planning for Broadband Expansion and building broadband infrastructure, including Maine’s ConnectME Authority, which OTELCO recently partnered with to build fiber to the home in parts of Lowell and Gray, Maine. OTELCO is proud to be engaged in this discussion, and we look forward to working with our peers and community leaders to build a faster, more reliable rural broadband network for Maine. If you are a municipal official or an interested citizen that wants to learn more about broadband access, take a look at our Guide to Municipal Broadband or you can download our Municipal Primer.